It's not the best photo but heck it was 6am! LOL! OK ..I just read your last 4 posts and you sound like me....same stress different issus, LOL. I hate it when the blow comes by...Dang! LOL. I haven't even blogged since Thursday! I need to find an A's one to balance out this adorable hat. It's an awsome pic, and kudos to you for pulling out your camera at 6am! He looks great - especially for 6 a.m!! Did you MAKE this hat? PS - i blog rolled ya I hope that's okay?? Great picture, and what a FUN hat! Happy holidays! LOVE the hat!! I have a Patriots one myself! So FUN!!! 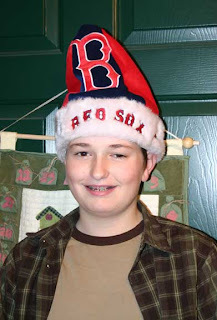 You are a GREAT New England Mom - who wouldn't want a Red Sox Santa hat?